Mod: I was poking around the California Policy Center website last evening and came across a very interesting page. Apparently there have been referendums put on the ballot and voted upon by citizens in their towns in order to control pension costs. In most of the cities listed the taxpayers won, meaning the kinds of controls their City Councils were incapable of putting into place themselves were voted into existence by the people whose taxes pay for such things. To view all of this in its original CPC habitat, click here. I know it's the dog days of Summer and all, and even in the best of times this would be rather ambitious. But there are ways to stop cities that cannot seem to control spending on employee benefits and pensions. You know, like the one that pays for - hint hint - some of the highest costing health plans in the State of California. One way would be a ballot measure to end the UUT altogether. Another would be to do what is described below. Something to think about. We'll bring this all back up in September when benefit reform is before the City Council. Key Provisions: The initiative would establish 401(k)-Style Plans for new employees with contribution rates based on private sector benchmarks. The initiative ensures any County employees who put their lives on the line to keep the public safe are protected with death and disability benefits for them and their families. Under the Pension Reform Initiative, county politicians would receive the same basic benefit as other county government employees. 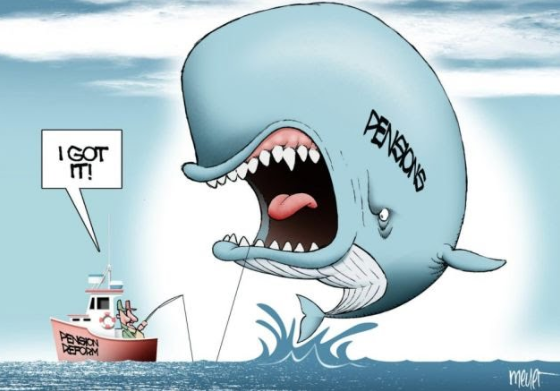 Politicians would not be able to vote on their own pension benefits. The initiative will reform existing pension payouts to more sustainable and acceptable levels by capping for five years the amount used to calculate higher paid county employee’s pensionable compensation. Key Provisions: Affirms that Ordinance 02-18, the legislative act that implements the 3% at 50 pension benefit increase retroactively, was null and void. Affirms legal right of residents under State law to know the future costs, as provided by an actuary and revealed at a public meeting, of any increase in pension benefits before any such increase is enacted and also, that any action to do otherwise is legally null and void. Affirms that resident’s right of Referendum shall not be infringed. Key Provisions: Creates defined contribution plan, possibly including social security component, for all new hires. Current employees contribute amount to their pensions and retirement healthcare benefits equal or greater than amount contributed by city. Pension eligible salary based on average of final three years pay. Limits pension eligible salary for any employee where city contribution exceeds 15% of payroll (25% for public safety employees). Requires disclosure of pension costs including sensitivity analysis showing impact of changes to the rate of return on costs. Key Provisions: All new City employees, except police officers, to receive a pension plan with the benefits dependent on the plan’s investment gains and losses (such as a 401k plan or IRA), the City and all employees to each pay half of the pension costs, limits compensation used to calculate pensions to base salaries only. Key Provisions: Gradually increases current employee pension contributions to 16% of pay, offers “Voluntary election plan” (VEP) for current employees who don’t want to pay 16% for their pension. VEP limits pension accrual for future years of service to 2.0% of final compensation times years worked and gradually raises age of retirement eligibility to 57 for safety and 62 for non-safety personnel. Revises new employee defined benefits to cap city contribution to 50% of plan cost or 9%, whichever is less, raises retirement age to 60 for safety and 65 for non-safety personnel, caps pension benefits at 65% of final compensation. Key Provisions: Creates new “Tier 6″ reduced pension benefits for safety employees hired after July 1st, 2011. Key Provisions: Requires newly hired employees to pay 100% of their share of the required pension contribution, reduces their annual pension accrual to 2.0%, times years worked, times their average annual salary calculated over 36 highest paid consecutive months. Key Provisions: All future increases to the city’s pension formulas to require voter approval, and City Council can make any decreases to the pension and healthcare benefits of current employees when it thought they were necessary. Key Provisions: Lowered pension formula to 2.0% at 60 for the City’s non-safety workers from 2.7% at 55. Key Provisions: Caps the city’s contributions to employee pensions at 10% of their salary, and requires the employees to either pick up the difference or be placed in a 401k style retirement plan. Key Provisions: Non-binding advisory measure. Advises city council to require its workers to cover the employee contribution to their pension plan themselves. Key Provisions: Non-binding advisory measure. Advises city council to require its retiree’s to have worked for it for 5 years and be enrolled in Medicare before becoming eligible to receive contributions towards their retirement benefits. Key Provisions: Empowered the County Supervisors to unilaterally lower the pension and healthcare benefits to be enjoyed by its current workers. Specified that any increases to the current benefits scheme would have to be approved by the County’s voters. Lawsuit Against Measure M, Aug 2011. Key Provisions: Increased in the contributions made by the City’s employees towards their pension plans (from 7.5% to 9%), and called for an increased contribution by the City’s retirees towards their health insurance premiums (from 25% to 50%). Key Provisions: Required that all decisions made by an arbitrator must not create an unfunded fiscal liability for the city, and they must also decide with the City’s financial interests in mind. Key Provisions: Modified the City’s charter to allow the city council to place newly hired employees on a different pension and benefits plan than what was currently in place for other employees. How great to read about these changes! I always love to read about people fighting back and winning. Just like we did with Measure UUT! They're the ones with the money and connections. don't forget prop 13, where is Howard Jarvis and Paul Gann? too bad they are not still here. The organization is still here and very active. Google them, or if you need it, I can get the info to you. Now that is something I could really put a lot of energy into getting passed. Staff is a bunch of freeloaders. This makes sense. I like it! I know that I retired from a public school teaching position after 31.5 years, Masters degree at age 61 at a percentage of the highest year's earnings. Nothing like all this double dipping, padding, etc. that goes on now. And if you went on in to the private sector and earned beyond a certain cap that was reported on the SS then your teacher's retirement was rolled back. And I have to contribute to my health plan, although it is a very good plan and I am not complaining. I have no idea how this got to be so bad but it is time to fix it. When you see so called high teacher's salaries, don't forget that is after teaching 20 years, and in the highest column (i.e., 60 units beyond the BA with a Masters) so it is well deserved! I have trouble understanding your point. 12:15 is simply not true. The City Manager did not change for her time. The time charged was for the community service staff. Right. At around $75 an hour. City Hall calls it "recouping costs." Those in the know call it monetizing. and if the community service staff were the ones being paid, were they doing this massive undertaking of preplanning the route while already on the city clock? I've worked on large scale events and both of these events are repeititive events, nothing changes yet it takes 500 hours to plan? Double dipping doesn't exist in your estinmation? You really want to say that? To deny double dipping is absurd. Besides, the post is about city employees. 9:56 is still sore about yesterday's Tattler. For every dollar earned over a certain amount a teachers pension is reduced by that amount.....I am certain. rememberr when public employees (teachers, local government, state) were admirable positions but the pay was generally lower, more stability and employees generally worked 30 or 40 years and retired comfortably? "rememberr when public employees (teachers, local government, state) were admirable positions but the pay was generally lower, more stability and employees generally worked 30 or 40 years and retired comfortably?" I like my bitters with gin and vermouth. 1) the city manager is on vacation! 2) Does any one have any idea how many days a year sierra madre residents pay her to be gone from the city hall chicken coup per year? 1) Is Sierra Madre City Hall opened during her 11 day vacation? Still awaiting a telephone call ? Looks like Mr fact man is related to Mr all caps man who likes to pose questions that obscures the facts.City manager has the right to a vacation. Are any of those new openings? Like the Senior Program helper? It appears that Karin is hanging it up. Anyone have any details? She is running away with Earl to start a new life in Tahiti. I wish them the best. So few have to courage to capture happiness like that. Karin is a Finance Director. Is she leaving and the position is bring downgraded to a Mgr? Or is this an additional mouth for us to feed? Teachers do not retire after 20 years, they hit the last column of salary increases after 20 years. Then it is COLA increases if and when the district has the money to off such "raises." If you get a BA/MA long about age 23 to 25 and then teach for 20 years you are no where near retirement age and you continue on until age 61-65 and retire at the upper salary scale. It is not richville by any means. Private industry jobs have declined to the point where the public sector looks way out of line. Unions have pretty much been wiped out in the private sector. The public sector shake out will happen as well. The taxpayers and private industry cannot afford for it to be otherwise. In today's economy none of that is sustainable financially. Re: teachers and 5:29. I disagree. Any job with a defined benefits pension with Cola is a rich job. No one hired in the private sector in the last 20 years had that deal. Where are the taxpayers' guaranteed pensions? The taxpayers are already paying all the public pensions. People working in the public sector have no idea what people in the private sector are going through. It doesn't occur to them to even ask. Great, a race to the bottom..union forever!